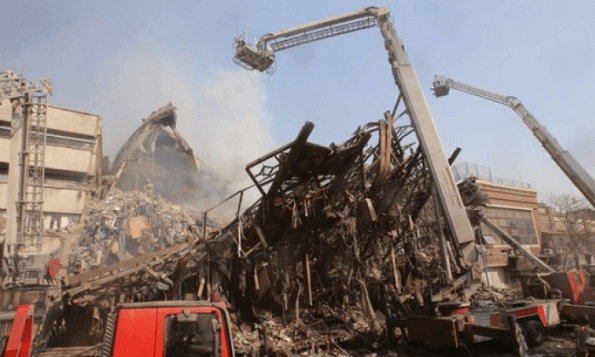 A 17 – storey building in which dozens of firefighters tried to extinguish a fire has collapsed on Thursday in Tehran, according to images broadcast live by Iranian state television. There are at least “70 injured, 23 of them hospitalized”, said the director of the emergency services, Pir Hossein Koolivand. In addition, several firefighters are missing. The Plasco building built in 1962 and housed a mall and textile workshops, has been evacuated moments before the collapse. It was one of the first towers built in the Iranian capital. “I think even 40 or 50 people remain inside the building” under the rubble, estimated Ali, a firefighter involved in rescue work. “We don’t know how many are inside”, declared shortly before the head of the Tehran police, Hossein Sajediniya. “We have warned several times to those responsible for the building” that it was not safe, said a spokesman for the firefighters, Jalal Maleki, who regrets that they have not taken into account the warnings. The fire, which lasted for several hours, began on the ninth floor and spread to the last. They have not transcended the causes of the fire, which has caused the collapse of the northern wall of the building, whose surroundings are cut first by the police. The building is located on Yumhuri Avenue, one of the largest in the center of Tehran.